This week I used lesson plans from Itty Bitty Bookworm's Bo Curriculum to review (and just as a head's up - I'll be hosting a giveaway for a FULL year of her curriculum next week...so stay tuned!!). Next week I'll be posting about Silly Sally and the letter 'S', another lesson used from Itty Bitty Bookworm. We borrowed the book I Went Walking by Sue Williams from the library and had a lot of fun doing the activities that Itty Bitty Bookworm lays out in the plans ~ let me tell you, it's all there for you! We still continued with our alphabet book and letter sheet activity on our own, but otherwise pulled our activities from the lesson plans. 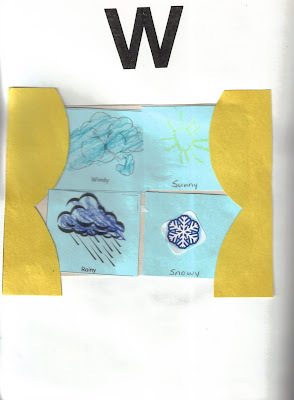 'W' is for window and weather, so the two were put together to show weather out our window: windy, sunny, rainy and snowy. The plans provide a booklet to print off that has each of the animals in the story along with a blank to fill in with a color. Zachary used a word bank to fill in the missing color word for the animal (according to the story animals - his choice) and then colored each page of the book to make his own special story. He was so excited to read it to us all! One of the games we played was charades. We had to act out one of the animals in the story: cat, cow, horse, duck, dog, or pig ~ Kaleb had fun along with us on this one. After we were done with the story animals we had fun trying to guess other animals that we acted out. We played a fun game of acting out different movement words. In the story we go walking, but then we pretended we slithered, jumped, ran, skipped, hopped, etc...and got a little energy out. It was fun to see what words Zachary could think of too. 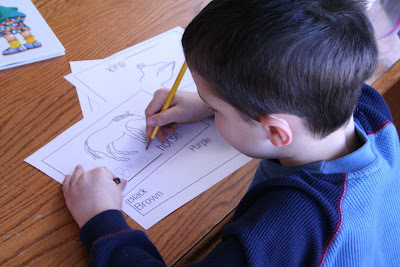 Sequencing: The curriculum provided sequencing cards of all the animals. I printed them off and colored them all like they were colored in the story. Zachary then put them in the order that they appear in the story. We did this activity several times to test his recall on the story. 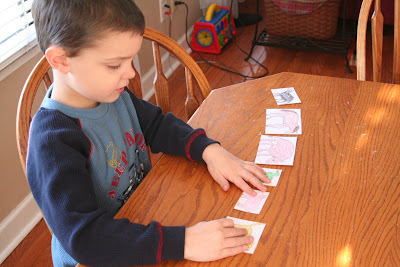 We also used the sequencing cards to sort the animals from smallest to largest. Buying a pet: Play money and animal cards were provided through the curriculum for me to print off. Zachary was given all the money and chose one of the pets to buy with his money. He had to tell me how much it cost and then pay me with the correct amount of money if he still wanted that pet. I used some different approaches this week with Zachary in reading. Before I read the book, we sat down and flipped through the pages (a suggestion from the lesson plans) and had him tell me what he thought would happen in the story just by looking at the pictures. We also talked about if the book was real or pretend (fiction/non-fiction) and and then read the story together. Each day we read the story I had Zachary try to recall what happened before we opened the book. We also added a few similar books to our list (see below) and read those too. Other things that we did included acting the story out (we walked through the house and pretended to see what the book saw) and talking about what our favorite animal was in the story (and why). We used our Peterson's Handwriting sheets to practice our W's - even though it's just two V's, Zachary was getting so frustrated (and he has the M down pat - go figure). i will so be there next week for the giveaway!!! sounds like a fun program! i am curious when you do school with zachary? how often?